Product design at the very beginning is the key to successful production runs. The design informs the production process. 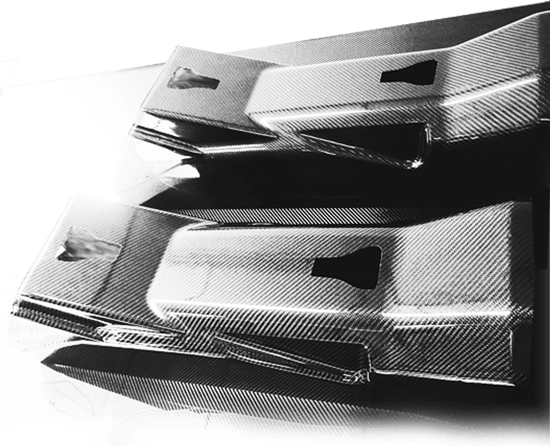 Therefore we place a high priority on analysing the product and its carbon fiber elements. We provide consulting services about carbon fiber technology, taking into account budget, geometry, thickness, threading, joints etc. We possess the know-how and expertise required to plan the project in a manner that allows successful implementation of carbon fiber elements. 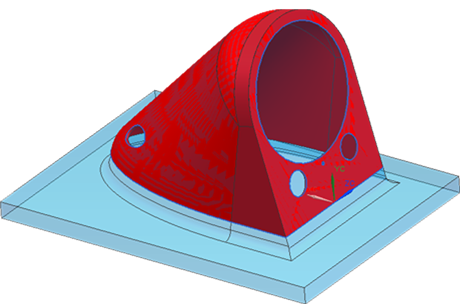 Our services include scanning products and enhancing 3D drawings which, after any required modification, provide the basis for milling molds or models to be used as tooling during the manufacturing process. Conversion of 2D drawing into 3D CAD design. We can produce existing products as well as taking completely new ones from concept and 3D drawings to full scale production. We have expertise in series production or small volume production of carbon fiber products (min. 20 items). We have implemented over 100 projects for series production of carbon fiber products for many purposes: automotive sector, military, health care and rehabilitation, industries, water sports and many others. We supply products for leading companies in Germany, the United Kingdom, Belgium, Spain, USA, Poland. Thanks to over 10 years experience and advanced technological resources (including our own autoclaves) we supply products that meet the requirement of even the most demanding clients. 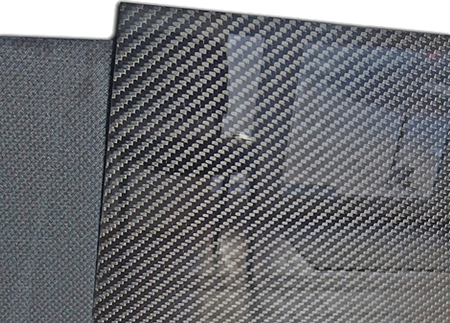 We supply premium quality carbon fiber sheets – watch the video. We offer CNC cut sheets from 0.2 mm to 45 mm thick, sized max. 145x280 cm, 100% carbon fiber, hybrid (e.g. carbon-aramid or carbon-glass), and with core (honeycomb, Coremat, Airex). 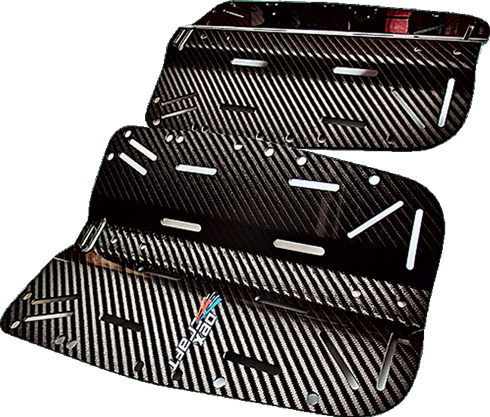 We also offer a carbon fiber cutting service to any shape with 3- or 5-axis CNC milling machine. Depending on production volume, we provide 3- or 5-axis milling of plugs and molds. For this purpose we most often use aluminum or tooling boards (polyurethane or epoxy). For series production, one model (called the master) undergoes milling to be later used for delivery of 10, 20 or more composite molds. 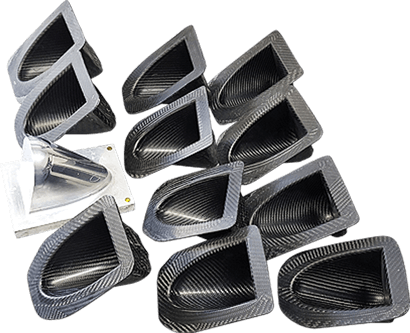 Molds are delivered using a pre-preg technique (carbon fiber molds) or manual laminating – if pre-preg or baking with autoclave is not required. Before production, the prototype is completed and assessed by the client. At this point, the client verifies the product’s functionality, dimensions and aesthetics. Product cutting follows with a 5-axis or 3-axis milling machine or based on templates. Machine cutting ensures 100% repeatability of each product and top quality edges. We supply services for cutting the finished composites to the desired shape. Finished carbon fiber composites undergo varnishing to ensure high class top coat. This phase is crucial for premium products manufactured with pre-preg technology. Upon request, we brand the product with the client’s logo before covering with a clear top coat to highlight the branding or origin. Bonding relates to joining composite layers, as well as carbon fiber composites, with materials of different thermal expansion coefficients e.g. aluminum. Depending on the requirements, we also use methacrylate or epoxy based adhesives. We can also assemble finished products. Our highly skilled specialists guarantee delivery of the output in a highly professional manner. Rigorous quality control at every phase of production ensures the end product is free of defects and air bubbles or other undesired flaws. Actually, quality control confirms the reliability of the techniques we use, as well as the machines and the competence of our specialists. We know how important timely delivery is to building long term confidence and relationships. Therefore we maintain a stock of our products to ensure prompt delivery or timely order execution. Maximum operating pressure 8 bar, maximum curing temperature 150° C - for production of premium quality carbon fiber composites (pre-preg). We store pre-impregnated raw materials, including carbon pre-preg in refrigerated storage units. Oven #1 - 2x2x2m (maximum temperature: 200°C) fitted with bogies. Oven #2 - 90x90x170 cm (maximum temperature: 140°C). Our paint spray booth ensures high quality painting of carbon fiber components. Production line including 3 workstations, each 150x280 cm, fitted with efficient vacuum pumps and heating system. For sanding sheets to the desired thickness, to accuracy of 0.05 mm. Our clean room provides a contamination free environment to lay-up composite materials, ideal for pre-peg lamination.